Plot Synopsis: Ten years after simian flu wiped out much of the world’s homosapiens, genetically enhanced chimpanzee Caesar (ANDY SERKIS) and his ever-growing band of followers have established a thriving colony just outside San Francisco in Muir Woods. Meanwhile, a small band of human survivors emerges, led by a man named Dreyfus (GARY OLDMAN), which forces Caesar – as leader – to grapple with the dual challenge of protecting his people and re-establishing a relationship with the remaining human population – the latter being Caesar’s secret wish. 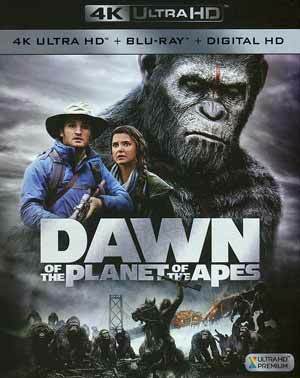 Quick Hit Review: The second in the revamped series, Dawn of the Planet of the Apes is a tad better than Rise. Taking over in the director’s chair is Matt Reeves, who offers insight into the war between man and ape but, as with Rise, gives some wonderful evolution, so to speak, for the apes and in particular, Caesar and our bigger nemesis, Koba (TOBY KEBBELL), as the two sides come closer toward war which will culminate with the upcoming War for the Planet of the Apes. Dawn is a well made film that features some fantastic visual effects in conjunction with solid performances from Andy Serkis, Jason Clarke who shows some actual range, Toby Kebbell as the ape villain and Gary Oldman who is rather subdued compared to some of his past performances. This release comes with a textured-like slip cover. Inside is a code for the Digital HD copy as well as a Blu-ray Copy. Audio Commentary – Director Matt Reeves offers his insights on the film from his technique, working with the actors and other tid-bits. As solo tracks go, it’s not too bad. Deleted Scenes (4:34; HD) – There are only four scenes here but we do get Reeves’ explanation on why these were removed. Journey to Dawn (8:47; HD) looks at continuing the saga that began with Rise, its success and the offering of the next chapter. Andy Serkis: Rediscovering Caesar (9:02; HD) has the actor offering his thoughts on furthering the character. Humans and Apes: The Cast of Dawn (17:47; HD) breaks down the cast on both sides. 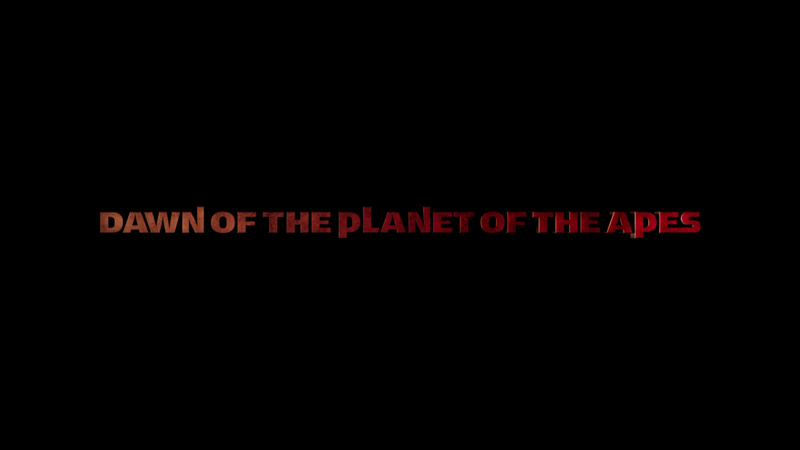 The World of Dawn (14:31; HD) is about the new world as shown in the movie, taking place 10 years after the events of Rise. The Ape Community (10:26; HD) is about the dynamic between the ape society. Move Like an Ape: An Artist’s Medium (15:25; HD) shows the workshop for the actors using motion capture and practicing realistic ape movements. WETA and Dawn (20:27; HD) examines the visual effects work done by the legendary effects company. The Fight for a New Dawn (16:00; HD) is a behind-the-scenes featurette on the final fight sequence via visual effects. As with the previous installment, Dawn of the Planet of the Apes gets the 4K treatment, and from what I could tell, the 2160p UHD transfers are pretty similar. 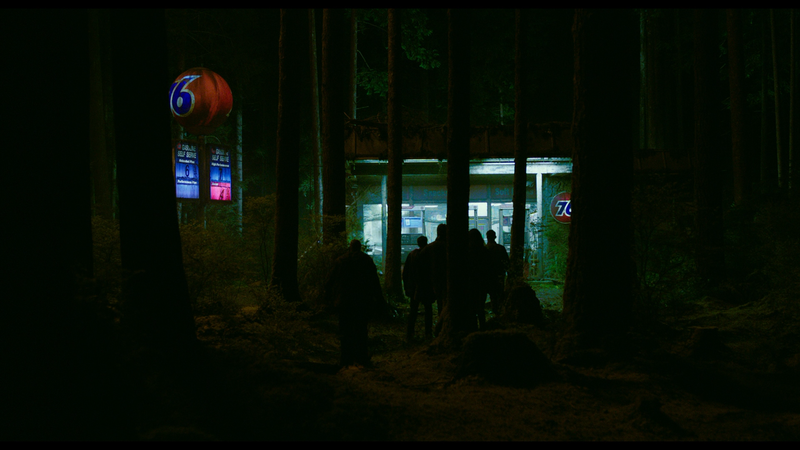 Like Rise, this one features incredibly sharp detail throughout and although it is a dark movie both in terms of tone and look, there are pops of color, such as when the humans get the power going and lights of an abandoned 76 stations turn on; the look of really contrasts with the dark background. 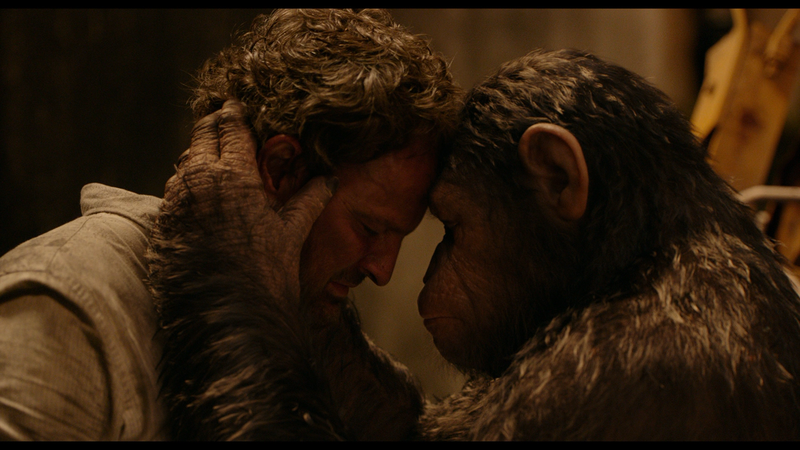 Skin tones also have a natural appearance and the fur on the apes, albeit still CGI, looks fantastic. The film comes equipped with a 7.1 channel DTS-HD Master Audio track (both the 4K and BD) and while it is a shame it wasn’t upgraded to Atmos or DTS:X, this is still a rather robust soundtrack showcasing clear dialogue levels and excellent usage of the surrounds, particularly during the fight sequences which has apes all over the place as well as some well placed explosions. It’s impressive an all around impressive lossless track. Overall, a solid improvement over Rise, Dawn of the Planet of the Apes has director Matt Reeves taking the franchise to the next level providing some well written and finely directed scenes especially with the apes, and in particular Caesar and Kobo, giving a glimpse not really seen before in this series. This 4K/B combo pack offers amazing video/audio and a nice selection of bonus features.